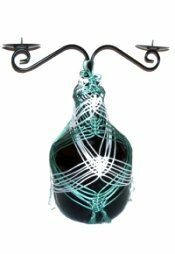 Description: This Bottle Candelabra is made with just a regular wine bottle, partially covered with Square Knots arranged in an unusual manner. You can use any type of material, as well as a variety of bottles. This Macrame pattern is written for two colors. You can use a single color if you wish to change this design. Adding beads and small items like shells is a good way to decorate this basic design. Since you need to be able to tie knots and add cords without a project board, this Macrame project may be too challenging if you are a beginner. Be sure to practice tying Square Knots without a board several times before attempting this project. Important: Since I used Satin cord for my Candelabra, I had to make the knots very tight and use glue so they didn't loosen. I recommend you use a material like cotton, the first time you try this design. Here is the mounting process I used in the Bottle Candelabra shown. If you wish, you can use a different mounting technique. In the example shown, color 1 is blue-green and color 2 is light silver. Begin by cutting 6 cords of each color, each 2.5 yards long (Color 1). Cut one holding cord, at least 15 inches long (Color 1). Step 1: Secure three 2.5-yard cords to your board, folded in half (Color 1). The cord in the center needs to be slightly higher than the other two. The two ends furthest to the left and right will be the working cords for the following knot. Step 2: Tie a Square Knot using the two working cords. The fillers are the other four. Tighten the knot so the loop in the middle is approximately 1/2 inch in size. Step 3: Secure the holding cord so it's horizontal. Position the loop design you just made so it rests against the top of the holding cord. Position the working cords over the holding cord. The fillers should be under the holding cord. Step 4: Tie another Square knot with the two working cords around the fillers. It should rest below the holding cord, as you pull it tight. Repeat steps 1 - 4 again, using the other Color 1 cords. Leave space between the two loop designs, for other cords. Step 5: Now you will mount the Color 2 cords, fitting them between the two loop designs. Start by folding one in half, and place it under the holding cord. 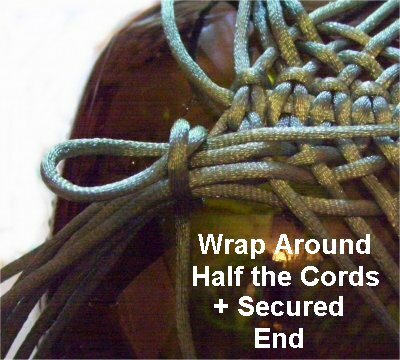 Tie a Larks Head knot by bringing the ends over the holding cord, and then under the folded area. 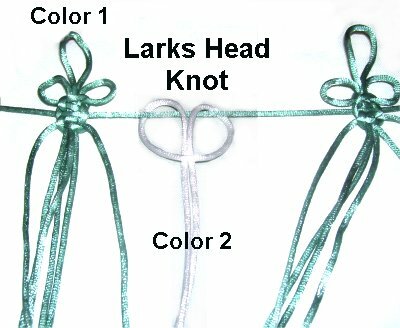 Step 6: You will now make two more Larks Head knots, one with each end. 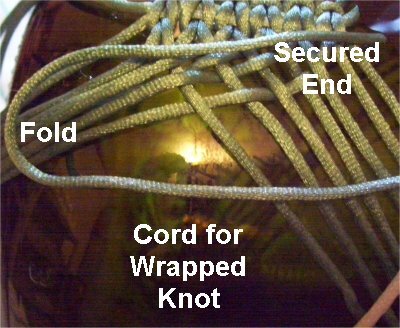 To make the first half of the knot, you move each end over - under the holding cord, and over the working cord at the bottom. Now make the second half of the Larks head knot. Move each end under - over the holding cord, and under the working cord at the bottom. Step 7: Repeat steps 5 and 6 to add two more Color 2 cords (total of three cords mounted). Slide the loop designs over, so they are on either side. The remaining Color 2 cords should be mounted to the left of the others, in the arrangement you see here. Repeat steps 5 - 7 to attach them to the holding cord. 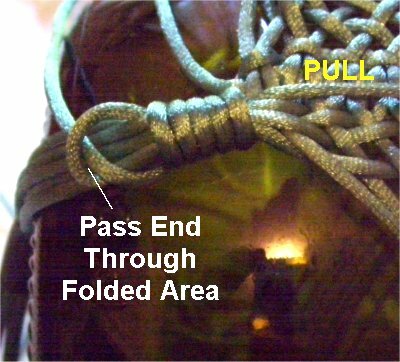 Step 8: Tie the ends of the holding cord together, with an Overhand knot, pushing the mounting knots as close to each other as possible. Place it on the Bottle Candelabra to see how it fits, but remove it when making the adjustments. The design should fit tightly around the top of the bottle, so it can't slide off. 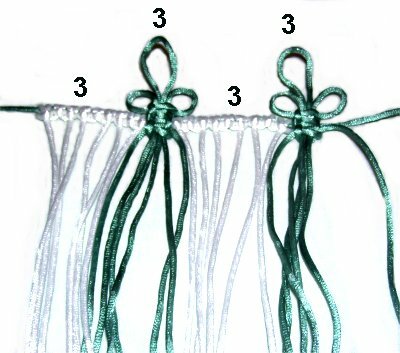 Important: You will know it's tight enough when you have to stretch the design slightly to attach it, once both knots are tied. 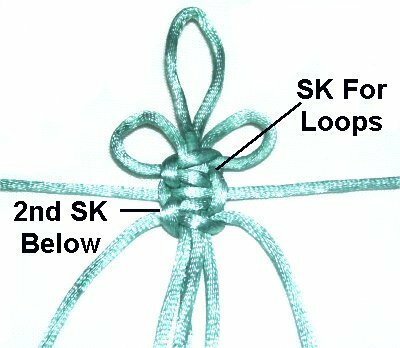 When it's the right size, apply glue to the first knot, and then tie a second Overhand knot. Place the mount design onto the top of the bottle, applying glue underneath it. 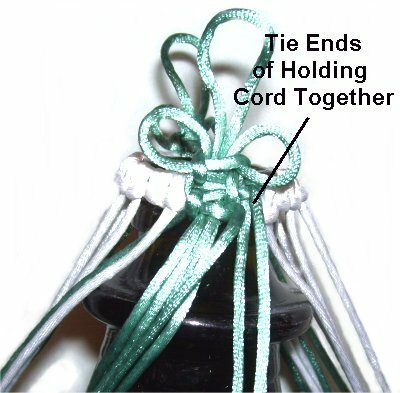 Trim the ends of the holding cord to 1-inch and attach them to the Bottle Candelabra with glue. Position them under the other cords so they are hidden. Allow the glue to dry before moving on. The top section of the Bottle Candelabra requires you to add cords. You won't be able to use a project board to do this, so please practice Adding Cords with a Square Knot before starting this area. You will work with each group separately, so start thinking of them as four distinct groups. The color 1 loop designs are in the front and back of the Bottle Candelabra. Color 2 cords are on the right and left. 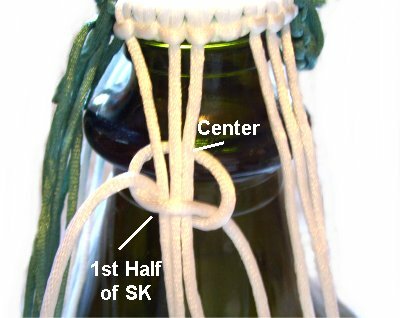 Step 1: Fold a Color 2 cord in half, and place the center of it under three of the cords mounted to the bottle (same color). Tie a Square knot with the new cord. The ones already on the bottle are the fillers. Tighten firmly, pushing the knot up to rest against the mounting knots. Add the remaining 7 cords in the same manner. Make sure you attach each new cord to three mounted ones of the same color. Push them all up as high as possible. There should be a total of 10 cords in each of the four groups when you are finished. Mentally number the cords in each group 1 - 10. Tie a Square knot using cords 4 - 7. Do the same for the other groups. You will now make what I call "Crossover Designs". You combine cords from two groups (same color), bringing them across the bottle to the opposite position than where they start. So for the first row, the cords from the back and front end up at the sides of the Bottle Candelabra. The cords at the sides are brought to the front and back. For the second row, they are returned to their original position. Step 2: Mentally number the cords in one group 1 - 10, moving left to right. For the other group of the same color, number them right to left. The reason for this is so you work with two cords of the same number, which makes this process less confusing. You can actually label the ends with tape, writing the numbers on it with a pen. The images below show Color 1, but you can start with Color 2 (white) if it's easier for you, since they rest under Color 1 (green). The two fillers are cords 10. 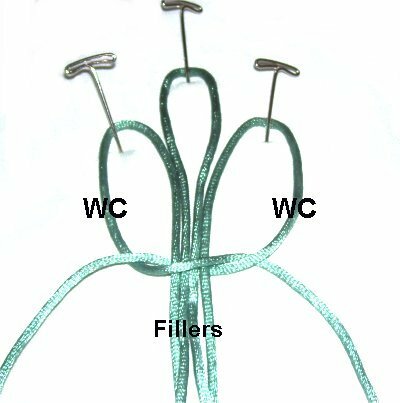 Use cords 9 to tie the first Square knot around the fillers. 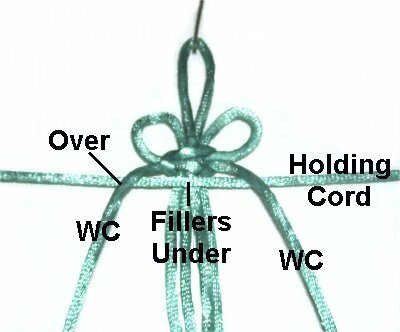 It should line up with the Square knot tied in step 1. Try to tighten it so it's about 1.5 inches below the other knot. Step 3: Locate cords 8, and pass them over cords 9. Use them to tie the next Square knot onto the fillers. 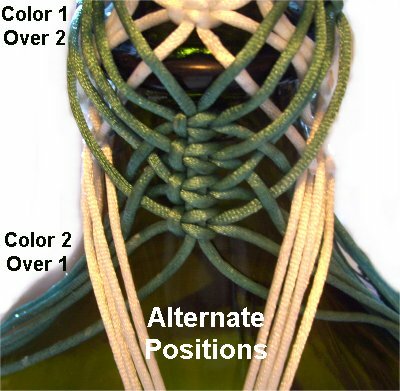 It's best to tie the knots loosely, so you can make adjustments to the Bottle Candelabra design. When you finish the other side, and everything is balanced, you can then go back and tighten them firmly. Design Tip: When making your Bottle Candelabra, do not try to pull the cords tightly. Instead, they should have a gentle curve, so they drape like a necklace. Step 4: Use cords 7 next, moving them under cords 9, and over cords 8, before tying the Square Knot. Step 5: Use cords 6 next, moving them over cords 9, under cords 8, and over cords 7. Tie the 4th Square Knot in the crossover design. Go to the other side of the Bottle Candelabra, and use the remaining cords of the same color. Cords 1 are the fillers. Use cords 2 - 5 to tie the SK, following the same over-under sequence as what you just did with cords 9 - 6. Once everything is balanced, tighten all the knots firmly. Apply glue to the back of the knots if you wish. Important: Do not attach this design directly to the Bottle Candelabra. It causes the knots to become unbalanced. Step 6: Repeat this process with the cords of the second color (steps 2 - 5). 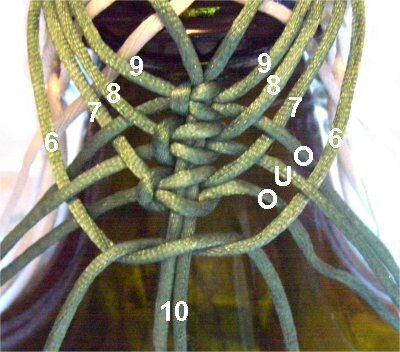 After all four groups are knotted, alternate the positions of the cords. So Color 2 will now be used to tie a row of SK, starting 1.5 inches below the last knot of the Color 1 design. In the previous row, Color 1 passed over 2 (green over white). Now it should be the opposite (color 2 over color 1). Step 7: Chances are the bottle is becoming larger at this point. If not, skip this step until the Bottle Candelabra begins to widen. Cut 4 cords, each 2 yards long (both colors) -- total of 8. 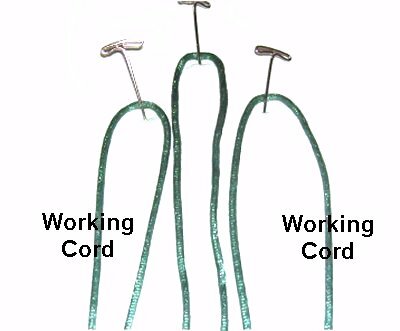 You add one cord to each group in the same manner as in step 1 -- Place the new cord under the two fillers. Tie a SK with the new cord. Make sure you complete this same process in all four groups before moving on to the next step. 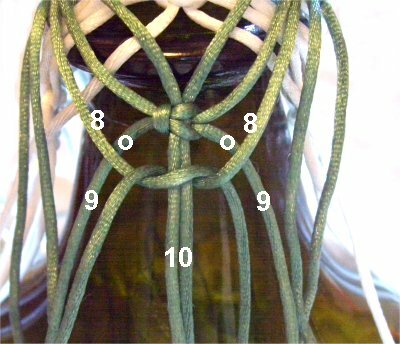 Tighten all the knots firmly, and check that the designs are positioned evenly around the Bottle Candelabra. Design Tip: I found that measuring down from the knot above was the easiest way to make sure all the groups are positioned the same. Step 9: Repeat steps 2 - 6 at least two more times. 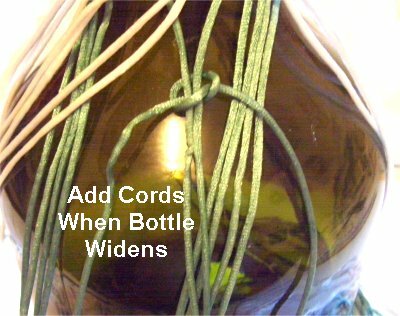 Add more 2-yard cords as you did in step 7, if the bottle continues to get larger. In the images shown, I added cords in the 3rd and 4th rows, but not the 5th. Make sure you change the position of the cords each time you repeat (front/back to sides). Switch the colors each time as well (Color 1 over 2, and 2 over 1). Remember that the over - under sequence will change if you add cords. Make sure that half the cords from each side are used in the crossover designs. So if there are 12 cords, use 1 - 6 in one group, and 7 - 12 for the second group. 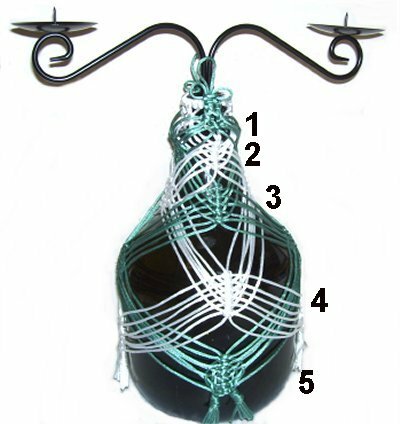 Design Tip: The weaving for the Bottle Candelabra should always end by going over the cords closest to the fillers. You may need to mentally re-number the cords as you progress. Make sure you move down at least 2 inches as you begin each new row. Try to keep the cords on an angle, even if you have to move the knots down more than 2 inches. As you can see in this image, the 4th and 5th rows are more than 2 inches below the 3rd row. 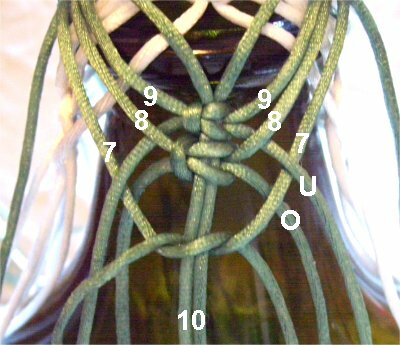 For the final steps in your Bottle Candelabra, you need to decide how to deal with the ends. 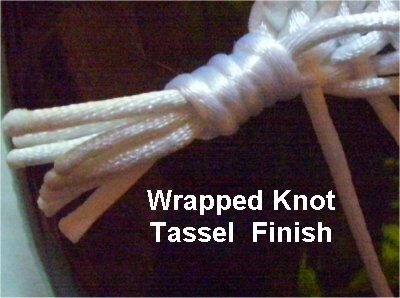 I made Wrapped Knot "tassels", but you can also make a fringe, or add beads. Step 10: Cut one cord, 18 inches long. Secure one end with tape, next to the last crossover design. Move down 6 inches, folding the cord (closer to the bottom). The long portion is used to wrap the bottle cords. Make sure you only wrap half the number of cords in each group, so you have two tassels per group. Step 11: Wrap the long end of the cord around the secured end, as well as the cords from the Bottle Candelabra design. Wrap firmly, at least 4 times. Step 12: Pass the working end through the folded area of the cord. Make sure you hold the wraps in place. Pull the secured end so the loop is pulled inside the wrapped portion. Step 12, continued: Apply glue to the entire knot before cutting the secured end flush with the top of the Wrapped knot. 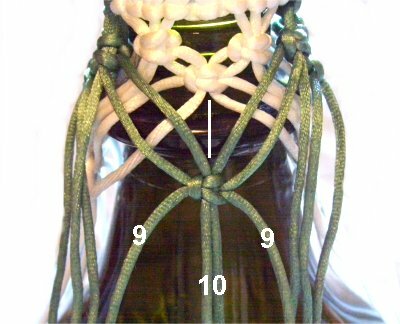 Step 13: Trim the ends below the Wrapped Knot so they are even with the bottom of the bottle. Heat the tips or apply glue to prevent unraveling. Step 14: Place the cork for the metal candelabra into the neck of the bottle. You can add tape to the cork if it wobbles too much. Have any comments about the Bottle Candelabra? Contact Me.